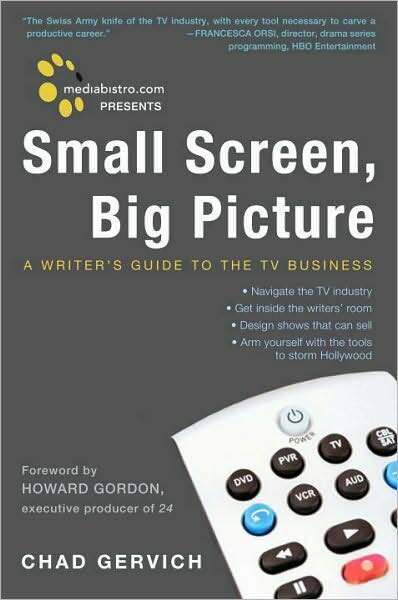 Small Screen, Big Picture gives you a competitive edge over millions of other aspiring writers who share your talent, creativity, and determination … because after reading this book, you'll have the one thing they lack: an understanding of the business of television. From mediabistro.com, the media industry's most well-respected source for jobs, professional development, and community, this inside-the-business guide gives you the knowledge and tools you need to infiltrate the cutthroat world of TV and land a job as a TV writer. That's right — how-to launch your career and make it as a TV writer. Small Screen, Big Picture not only details how networks, studios, and production companies work together, it teaches you how the process affects the creation and writing of TV series, how shows make money, and — ultimately — how you can use this information to break into the industry. Chad Gervich has worked as a TV writer, producer, and executive. He's written, developed, and produced shows for for nearly ever network and studio in Hollywood, including the Littlefield Company, Fox Television Studios, Paramount Television, NBC, Warner Bros., ABC, Fox Reality Channel, E! Entertainment Television, and 20th Century Fox.